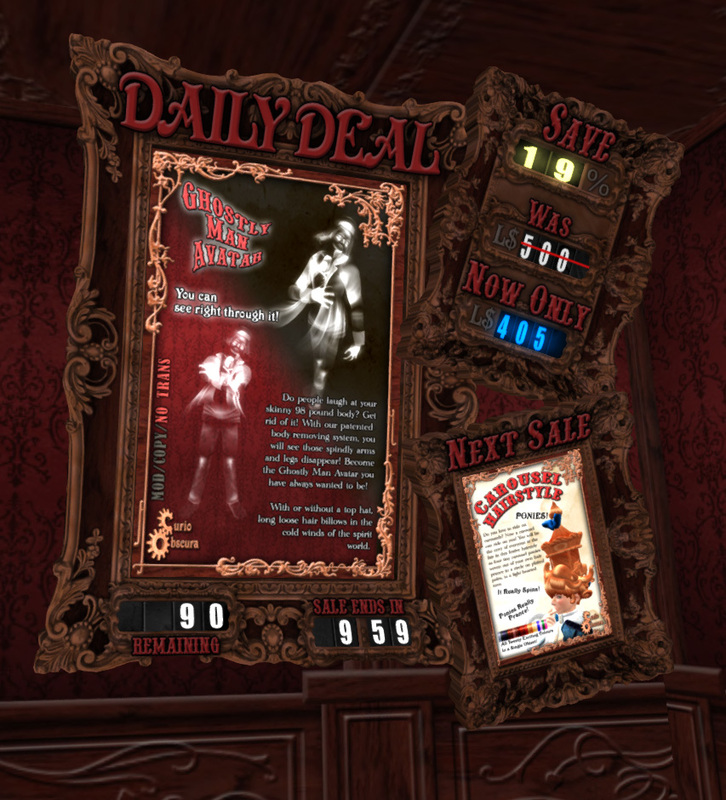 Nearly every Curio Obscura product is now featured in the brand new Daily Deal vendor where you can get strange and wonderful things for anywhere from 15% to 60% off. The Daily Deal changes every day and can be any non-gachapon item in the shop. Each deal is available only in a limited quantity and for a limited time so be sure to check in at the shop frequently so that you don’t miss a great deal on something you’ve been wanting. Once that deal is over, a new deal will become available. There is always a Daily Deal going on at Curio Obscura. It’s a never-ending sale on almost everything you could want! The Daily Deal vendor is on the third floor, next to the big window in the giant hat. Also, the regular prices on a lot of the older products has been reduced. Also, almost all of the vendors have been replaced with “Buy” style vendors so you won’t have any more difficulty with delivery or unpacking. Also, I just realized that I forgot to put the Unbrella gachapon in the shop after an earlier event so it’s there now.